What does gentrification mean to real estate agents? Gentrification is an accelerating trend throughout the country. You can identify areas likely to be gentrified by studying home value data changes and tracking its trajectory. Changes in tax laws can likewise incite influxes of new residents, resulting in further gentrification. Digital footprints and demographic changes with regard to geolocation can also indicate neighborhoods likely to gentrify. Measures can be taken to curtail the harmful effects of gentrification on local residents. These measures include constructing affordable housing close by, strengthening the rights of current tenants, and reducing property taxes for long-time residents. Imagine you’re walking down a sidewalk. The splotchy cement has worn, juts sharply up and caves down into puddles at random points along it, creating a web of sodden earth throughout it. Weeds and roots of nearby trees spill out of the cracks, indicative of an earthquake that took place decades ago that was met with no reparative efforts. The temperament of the sidewalk seems to conform to the entire neighborhood. Decay, dilapidation, and abandonment consume any semblance that industry once existed here. Even the foreboding overdraft denotes the perennial gloom ceaselessly wheezing down on the streets. To your left is an empty warehouse with boarded windows, no purpose beyond a blank canvas for spray paint tags. To your right, a brick apartment building with rusted bars surrounding any possible first floor entrance and windows so old each one has turned a pale yellow and droop down, cascading over themselves at the base like a waterfall of molasses. You reach the intersection and make a right. Suddenly like a jolt of electricity, a rush of warmth and light breathes over your face, and the sense of comfort that comes only when civilization materializes after isolation in a seemingly endless wasteland washes over. The streets magically correct to their intended linear state, and the grime and hopelessness left behind you vanishes with a single step forward. Baristas serve extravagant beverages to women wearing second-hand clothes, but speaking with vocabularies that suggest first-hand educations, and men with thick-brimmed glasses and eccentric facial hair, most of whom are either busily working on their laptops, or discussing start-up ideas propagate the streets. Across the street is a Whole Foods and a boutique jewelry shop that host similar patrons, eagerly consuming all that each has to offer. The coffee shop where the aproned baristas bustle in and out, desperately serving drinks to an impossibly long line is located at the bottom of an upscale silver high-rise, looming over the desolate neighborhood behind you, and proposing its impending demise. While this picture painted above may seem more appropriately placed in a Sci-Fi novel with an excessively obvious propagandist message of class inequality, there are actually several cities in America where this very scene is occurring without exaggeration. It seems almost unreal that this could happen in our nonfictional world, but there are in fact, several factors that contribute to this phenomenon that has understandably contracted an ugly stigma. This phenomenon as you’ve almost certainly guessed, is gentrification. So, what should gentrification mean to you as a Realtor? As a realtor, you know your clients’ needs are your number one priority. However, anyone who has been involved in the real estate industry in any way also knows that we, as realtors, have a civic duty to provide to the communities in which we serve. Balancing these two ideals can become tricky when it comes to gentrification, and we are left with a very difficult question: Is it possible to effectively direct clients interested in investment properties towards areas that are likely to gentrify, while simultaneously take action to curtail the negative effects of gentrification on current residents of those areas? It’s very tricky, and it’s unlikely there is a solution in which everyone involved will be completely satisfied, but current outcomes for both residents of neighborhoods being gentrified and investors looking to buy in these neighborhoods can be improved upon if we take necessary measures to identify areas that will become gentrified before gentrification begins. If we can successfully identify gentrification before it occurs, realtors can not only provide valuable housing tips to clients, but this information would provide cities the ability to take preemptive action to secure a range of housing options for current residents who might otherwise experience only the negative effects. There are many ways in which gentrification can be predicted before any actual gentrification takes place, and we will only improve upon those techniques with time. Already major real estate tech companies like Trulia and Zillow have experimented with predictive home pricing. They’re not necessarily predicting the future, (or at least not sharing that knowledge with the public), but using statistical analysis of home trends, they can accurately assess the worth of homes even in markets where no homes have been sold, allowing for a cumulative database of national home values. Zillow, for example, takes all estimated home values for a given region and month (Zestimates), takes a median of these values, applies some adjustments to account for seasonality or errors in individual home estimates, and then does the same across all months over the past 20 years and for many different geography levels (ZIP, neighborhood, city, county, metro, state, and country). From this data, a comprehensive and robust benchmark of home value trends can be computed which is immune not only to the changing mix of properties that sell in different periods of time, but location as well. Now that we have demonstrated access to a complete set of estimated data of home prices nationally, we can now explore some factors contributing to gentrification, and determine what fields and phenomena to best apply this data for predictive purposes. Let’s begin by pointing out one of the most obvious early identifiers of the process of gentrification: Hipsters. There is a lot of a somewhat mocking tonality when discussing the correlation between Hipsters and gentrification, but data shows, that joke exists for good reason. This correlation in fact is strong enough that a term has been popularized by one such instance of a Hipster migration to a financially unstable neighborhood: The Soho Effect. During the Industrial Revolution, the cast iron buildings that are iconic to the Soho neighborhood were being built as loft spaces meant for manufacturing and sales. After the decline of the manufacturing industry after World War II, these buildings became all but obsolete as far as industrial functions were concerned. Artists with low income and lower standards of living slowly started moving in during the 1950’s. After the founding of the Soho Artist’s Association in 1968, the buildings were rezoned and made legal for living and studio space for artists: then came the famous gentrification. At this point, financially well-off seekers of eccentric culture began to flock to this new hub of artistry and aesthetic creativity to consume what it now had to offer. The changes that these artists made attracted capital, reinvestment, and new residents into the area, pushing up real estate values and rents, and ironically, pushing out the artists, and transforming the neighborhood into a high-end residential mecca for the elite. It isn’t long after that in any gentrification process that surrounding locally owned stores are replaced by upscale coffee shops and other boutique merchandisers. This formula is so well-proven and heavily believed that the construction of eateries and bars meeting Hipster sensibilities can even be intentionally orchestrated in struggling neighborhoods as a self-fulfilling prophecy of gentrification. Dubbed, “Coffeehouse Gentrification,” certain Manhattan neighborhoods have seen real estate investors transform long-abandoned storefronts into java joints that had little hope of attracting mainstream tenants and making the units upstairs more attractive to renters and buyers in return. The results have generally shown a 21% increase in wealth of residents in just under ten years after the completion of the first new coffee joint. Another factor that often times contributes to gentrification is change in tax laws. Change in tax laws can sometimes deter new business in states where beginning a new startup was once relatively advantageous and supportive of small companies. When this happens, not only do new businesses cease springing up in these states, but existing companies headquartered in these states will take necessary precautions to relocate to states that have more favorable tax laws. And when these companies move in bulk by industry, the result is often a large shift in value from one state to another, and, in cases where this new state has been demonstrating substandard fiscal performances prior to this mass influx, the gentrification process rears its head. 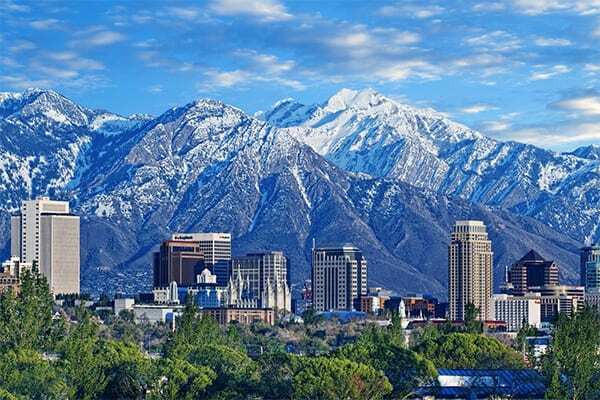 One such case of tax laws inducing an inflow of tech talent and value where once it was void can be seen in Salt Lake City. Utah has seen such a prolific increase in tech company presence that cities along the Rocky Mountains have been given the nickname, “Silicon Slopes.” A CNBC report states, “Low taxes; cheap real estate; a pool of young engineering talent from the University of Utah, Utah State and Brigham Young; and a business-friendly environment have all converged to make Utah the top local start-ups right up there with founding teams in Boston and New York in the East or Seattle and Silicon Valley in the West. The U.S. Chamber of Commerce recently ranked Utah No.1 in innovation and entrepreneurship, No. 2 in high-tech performance and No. 3 in economic performance in a study of all 50 states. The state also topped CNBC’s America’s Top States for Business this year.” And while Utah cities might not necessarily be at the helm of the conversation of struggling neighborhoods, the effects have demonstrated a strong semblance of gentrification. A slew of massive corporate headquarters immersed what was the base of a desolate mountain, and upscale residential homes engulf the once wilderness between Salt Lake City and Provo. Perhaps the most telling predictive element for determining future gentrification can be found in the comments and actions you, and everyone else takes on social media on a daily basis. Digital footprints are one of the greatest considerations for predicting what move you will make next. Think about how much personal data you spill into your social profiles. It provides a narrative for where you’ve been, what you’ve done, who you’ve seen, and why you did it. Through combining the movement data of like-minded individuals, trends can be determined long before they make any distinct impressions. In the US city of Louisville, analyzing the movements of Twitter users by their geo-tags showed mobility patterns in different neighborhoods. The results indicated that Ninth Street – seen as the traditional divide between the poorer, African-American community to the west and wealthier white community to the east – was no barrier to those living in the former, who were found to be more mobile across the whole city. According to Adam Frank of NPR, “By analyzing these patterns over months or years, it may be possible to see the “signal” of gentrification appear as people who normally would not be visiting a neighborhood begin making more frequent appearances.” From cellphones to credit card transactions to social media, we are all leaving digital contrails of almost all of our activity in the world. Learning how to harvest and analyze these digital traces holds the promise of allowing data scientists to see how societies operate at a resolution that was simply impossible before. And seeing hidden patterns in gentrification may be exactly the kind of task big data and data science are best at. While this example only applies to data we would expect to lead to gentrification, through machine learning, we will almost undoubtedly get even better at predicting it through correlative components that we would not have even considered to have any relation prior. After identifying a neighborhood that’s likely to gentrify based on the above measures, how can we help the residents of those neighborhoods looking down the barrel of disenfranchisement? Preventative action can be taken to ward off the negative effects of gentrification so long as it is taken quickly enough. Since we have the ability to accurately predict where gentrification is likely to occur, all that’s left to do is take proven preventative measures against its unsavory repercussions. Among these, cities can take it upon themselves to construct affordable housing close by, strengthen the rights of current tenants, and reduce property taxes for long-time residents. So, if we keep our ear to the predictive analytics grindstone as it concerns gentrification and watch for the tell-tale signs, we can not only provide valuable investor advice to clients, but help residents of downtrodden communities likely to experience the negative side of gentrification come out ahead as well.